Yesterday I got an email outlining why black hole can’t possibly exist. Those of you who are regular readers might be quick to point out that black hole most certainly exist, but the author is right. Black holes make no sense. I, and other scientists, have been lying to you all along. 1. 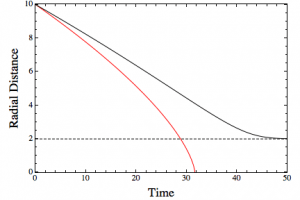 If time dilation increases the closer one approaches the event horizon of a black hole and from our perspective we see time essentially stop at the event horizon, how will a black hole ever form in our universe if nothing can ever cross the event horizon relative to us and the rest of the universe? 2. The explanation used for the creation of a black hole is that gravity increases due to an increase in the density of the material within the stellar object. Since gravity is many orders of magnitude less powerful than even the electrical forces being experienced between the nuclei of the matter in question how does the gravitational force overcome the repulsion between nuclei. I understand that the electrons will provide some neutralisation of the positive charges. However, even in standard forms of matter there are various electrical forces that occur, even though the atoms are technically neutral. 3. 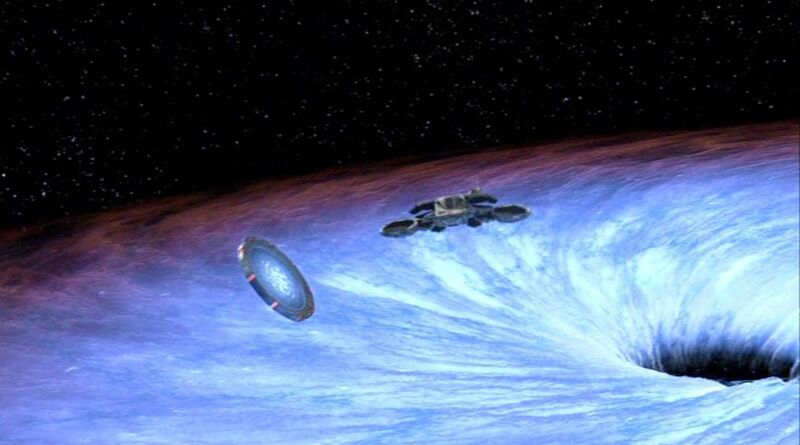 Thirdly, the event horizon is defined where the escape velocity is defined as being the speed of light. However, the escape velocity is defined by a specific criteria and circumstance, which is clearly understood in engineering circles does not apply to powered movement. That is the actual velocity by which you transition from from solar body to another can be as low as you like. Hence, you can cross any boundary, including an event horizon, under power at any speed (under the speed of light). It seems very clear then that black holes defy logic, so why do we scientists keep claiming they exist? Because the arguments outlined above are based on a pack of lies. When I say that I’ve been lying to you, this doesn’t mean I’ve intentionally tried to deceive you. It means that I’ve been intentionally feeding you information that isn’t entirely true in order to give you an understanding of what is really going on. For example, take these three points. 1. From our viewpoint, stuff takes forever to fall into a black hole, so a black hole can never form. The position of an infalling object as seen from outside the black hole (black) and from the object itself (red). One of the standard things said about black holes is that as material falls into a black hole it will be seen from the outside to never quite reach the event horizon. While this is true, it’s also true that from the viewpoint of the material it readily crosses the event horizon. What we often leave out in this discussion is that this is a rather simplistic description of the situation from only two vantage points. One of the central aspects of relativity is that all vantage points are valid, even when they seem contradictory. What this means is that to really describe the situation you have to look at all of spacetime as a whole. When you do this, it is clear that matter really does cross the event horizon, and black holes really do form. From the material’s vantage point you can see this, but from the exterior view you can’t. Of course to describe the whole of spacetime requires tensor calculus, so we typically omit that from the popular science tale. 2. Gravity is weaker than electromagnetism. Again, at a basic level this is true. Certainly if we were to put two protons close to each other, the repulsive force of their electric charge would be much, much stronger than the attractive gravitational force due to their masses. That would seem to contradict the common claim that black holes form when a star’s gravity causes it to collapse under its own weight. But gravity doesn’t cause a star to collapse. It’s the electric force that does it. Imagine a table standing in the middle of a room. The atoms and molecules of the table interact with each other through electric forces, which is what gives the table its rigidity. The table is perfectly capable of supporting its own weight, because the electric forces are much stronger than gravity. But suppose I were to start stacking books on the table. Eventually the weight of the books would cause the table to collapse. In that case, what caused the table to collapse? Gravity? No, it’s actually the force of the books right on the table’s surface. They push on the table so strongly (with the electric forces of the atoms and molecules) that the table can’t withstand it. Granted, the lowest books can push so hard because books on top of it are pushing on them, and all of this is due to gravity giving each layer of books a little tug. But technically gravity doesn’t cause the table to collapse, gravity just helps the electric force build so that it collapses the table. The same is true with a collapsing star. It is the electric and nuclear forces pushing against each other in the interior that cause the collapse. Gravity just helps those forces work together. 3. The event horizon is where the escape velocity is the speed of light, but that doesn’t keep us from escaping with a slower than light rocket. This is one of the biggest lies we tell about black holes. On one level it is true. If you calculate the escape velocity at the event horizon (according to Newtonian gravity), then it is the speed of light. It makes for a simple way to describe black holes and event horizons. The problem with the idea is that escape velocity is defined as the speed it takes to escape forever. But if I tossed a ball at just under the escape velocity, it would rise very, very high before falling back down. Using escape velocity gives the impression that a rocket could escape, just as we use rockets to escape Earth’s gravity. Behavior of light cones near an event horizon. Credit: John D. Norton. So the author is right about black holes not being logical, if what we typically say about black holes were actually true. But they aren’t. And therein lies one of the dangers of popularizing science. To make things clear, we often simplify things to the point where they aren’t fully true. We lie a bit to convey the central ideas rather than getting bogged down in the details. That’s fine if you just want to get a basic understanding of things. But it’s important to keep in mind that the analogies we use shouldn’t be taken literally. When you find contradictions in the pop-science description of an established scientific idea, it doesn’t mean the science is wrong, it means the truth is more complicated than we’ve been letting on. People are often devastated to find out that pictures of planetary nebulas, shock fronts like in the Eagle Nebula, etc are not “real” and they feel lied to. I’ve seen people say it’s not truth and that it’s a lie so many times over… but I think of it more of a translation than anything. Some things are always lost in translation but it is not as if untruth was the intent. Yes. Black holes most probably don’t really exist in our earthly frame of rest. But maybe some black hole is already forming somewhere in our ‘vicinity’ and falling towards us. If so, we are doomed. Its event horizon can cross us before we can see anything ‘special’. It’s a great challenge being didactic and rigorous at the same time. It’s the difference between a good science divulgator, good teacher or good professor, and a mediocre one. Then I learned here that the electrons “jump” from one level to another emitting a photon in the process but also that the electron moves from one energy level to another without crossing the “space in between”. Having Bohr’s atom model in mind – I found that really hard to wrap my head around. Then I learned that electrons can’t really travel around atom nuclei because they would loose energy which would make atoms unstable. Again, Bohr’s atom model seemed rather to hold me back in my understanding then letting me move forward. So I think that is just another example of what you were describing here. While Bohr’s atom model was a good start to understand the atom – if you give into the details then it rather leads to misunderstandings. I think it is the smashups between pre-relativistic and post-relativistic terms are confusing. The word Gravity should only be used pre-relativistic, and this should always be stated that way. Gravity is in classical physics no more then a conservative force. Meaning. When you ,standing on a star, could hold one of its planet still, you will notice that the planet only tries to move towards the star (you stopped it orbiting). The force and the direction you need to apply to keep the planet in place, that is gravity. Thats all. It should not be used post-relativistic. Except when classical physics is used to mathematical solve something. Post-relativistic we know that mass curves the spacetime geometry around it. If we agree that energy can be defined as: the scalar quantity that is conserved as a result of the spacetime-translational invariance of the laws of physics, then we also should agree that we should use ‘energy’ as main concept. Especially after Einstein showed that energy and mass are the same thing. We should use something like the Hamiltonian and completely drop gravity when speaking in post-relativistic terms. While i’m a smart guy, I don’t think the real explanations would have been all that difficult for people to grasp. Offering illogical explanations as a means of simplifying them disrespects the individual trying to understand, and does a disservice to science, if people are ever to put more trust in the words of scientists. And in order to quash the flames of ignorance, don’t give the fomenters of such any real fuel. Well, do keep in mind that this discussion stemming from another discussion about dumbing down, is still dumbing it down for we without the layman knowledge that comes from the years of study leading to his particular field. For instance, when squaring up an area for flooring, I show my apprentice how it’s run, after I’ve done all the math and referenced all walls for square, and that they run true to one another. With enough experience those details will be relevant to him, but until such a time, I don’t inundate him with details that would only bore and confuse him. Hi Brian, I love your words! Is a Black Hole the same as a donuts with a hole in the center, and the event horizon at the circumference; except with the revolving mass of the universe squirreling around it. We have never witnessed the birth of a galaxy, and the formation of its galactic core. Every wheel has a central hub; co every galaxy and universe has to have a central axis point for all matter to rotate around. A hurricane has an eye that it rotates around; so there seems to be a lot of similarities between hurricanes and galaxies and universes. It has been recently shown that light can be slowed down below the relative speed of light, and it has also been shown that light can be bent by electromagnetic forces. If the EM forces of a rapidly spinning Star produces enough gravitational force, could it pull light back on itself; trapping light within a Black pulsating Star? Does time stand still or become nullified at the event horizon? If one could stand on the edge of the event horizon; would they age; although, the galaxies have not always existed for infinity; they will one day come to an end. It seems everything come to an end; except space and time. The term “black hole” is actually not a great name for what black holes really are. They aren’t really a hole in space, but simply a region of intense gravity due to some super-dense matter. Here’s a bunch of posts on black holes I’ve written. You teach someone how to fish. My interest in maths started when my dad showed me an easy way to calculate multiples of 9. Tell them what kind of mathematics is involved. Tell them about the thought experiments that the scientists themselves have used.